What does The Slav Epic evoke in you? The Slav Epic is a truly unique artwork of epic proportions. The cycle of 20 large canvases form a pictorial time line of the mythological and historical establishment and struggle of the Slavic peoples. Each painting depicts a different event linked to the Slavic nations. Mucha uses different compositions of colour, symbols and figures to present ideas, hidden messages and various phenomena through his paintings. Whilst some aspects of the artworks have clear links to particular historic events, some are down to the interpretation of the viewer. One example of this is the arguable links many of the paintings have to Romanticism, an era from which Mucha likely drew inspiration. What does The Slav Epic mean to you? How do you interpret the meaning and message of the paintings? What does The Slav Epic evoke in you? Share your opinions and feelings. The end of the year is approaching, a period when winter takes hold and we wait for a new beginning; the return of spring. It’s a magical and mysterious time, rich in symbols, customs and rituals. With The New Year the world faces another fight between chaos and order. A familiar scenario that repeats itself throughout the Romantic Movement. We are able to find all these archaic phenomena in The Slav Epic; Alphonse Mucha’s masterpiece. His magnificent creation; a series of 20 canvases, exposes the history and ethnicity of the Slavs. The sequence relates to Bohemia, as well as other Central European regions, and is arranged thematically along allegorical, conflictual, religious and cultural lines. The monumental cycle of large-scale paintings is filled with incredible energy, folk inspiration and passion, drawing inspiration from Romanticism. The opening work, The Slavs in Their Original Homeland depicts a combination of visionary symbolism and historical realism. It confronts viewers with the trials of the original Slavic tribes, under constant attack by their enemies, set against the backdrop of a starry night. The allegorical figures represent a priest praying for mercy, levitating above “Slavic Adam and Eve” hidden amongst the bushes. The fear and vulnerability expressed in their faces seeks help from the viewer. The image intertwines opposing symbols: the boy – a symbol of war and bloodshed, the girl – representing peace and virtue. Their white clothing symbolises purity and innocence, in contrast with the flames of a village set ablaze by soldiers. These figures foretell the freedom that will come to the people, after independence is gained through war. Viewed from the perspective of Romanticism, The Slav Epic reveals Mucha’s close relationship with the myth of Slavdom, popular in the 19th century, and the romantic taste for the epic. The interpretation of history in the paintings owes a great deal to the views of Johan Herder, the 18th century German author from whom Mucha drew inspiration. While working on the paintings, Mucha dedicated considerable time and energy to research, including travel throughout the Balkans and Russia. By mapping the history of the Slavs, the artist was able to enter the soul of the people. The traces of Herder’s belief and the regularities of restored fate runs throughout the whole cycle, culminating in the final canvas Apotheosis of the Slavs. The painting reveals an approach typical of Romanticism and celebrates the independence of the Slav nations. Mucha confronts viewers with four different colours representing the symbolic reconstruction of the nation’s past. Blue expresses the dawn of the Slavs and their mythical prehistory, black denotes times of hostile invasion and oppression, and red commemorates the period of the Hussite wars. The golden-yellow centre of the composition symbolises peace and unity. The people in national costume, celebrate the birth of freedom in the new states of Central Europe. A figure of Christ blesses the entire scene acting as a protector of Slavic tribes, while a man with outstretched arms imitates Christ; acknowledging both the suffering of the Slavs and the hopes for the new republic. The Apotheosis of the Slavs unifies the entire series by presenting a vision of Slavic triumph as an example for all mankind. 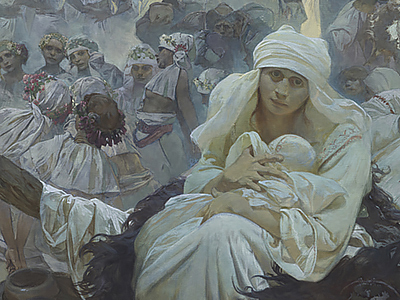 Although chronologically Mucha’s art work belongs to the 20th century, mystical fragments of the cycle show that its roots lie deep in the previous century. His work is reminiscent of the 19th century romantic ideal, with people celebrating him not just for his beautiful paintings, but also for his principles, that gave to their lives. My name is Aly and I would like to know if you would have any interest to have your website here at art-mucha.com promoted as a resource on our blog alychidesign.com ? thank you for your message. At the moment we are not interested in being included as a resource on your blog. We might let you know in a future.